You lose weight when you burn more calories than you eat. How many calories you burn depends on your metabolism, your weight, the intensity and length of your exercises, and how active you are when you're not exercising. You can, for instance, lose weight without doing any formal exercise if your occupation requires you to move a lot. You can also gain weight if you exercise several hours per day, but you are otherwise sedentary, and you eat more calories than you've burned. You need to burn 3,500 more calories than you eat to lose 1 lb., according to the National Institutes of Health. Burning 3,500 calories by itself is very difficult. Running 10 mph and bicycling 20 mph, the best calorie-burning exercises, according to a Harvard Heart Letter study, burn 733 calories, or about one-fifth of a pound, if you weigh 190 lbs. and exercise for 30 minutes. On the other hand, eating 3,500 calories daily is easy. Two Burger King Whoppers with cheese contain 1,446 calories. You might have to exercise more than you think to lose weight safely, because you need a lot of calories, which are units of energy, to perform everyday activities. An "average" woman, who is 5 feet 4 inches and 138 lbs., needs 1,900 to 2,200 calories daily, according to "An Invitation to Health," written by Dianne Hales. An average man, who is 5 feet 10 inches and 174 lbs., needs 2,300 to 2,900 calories. You need significantly more calories if you plan to exercise a lot. A 138-lb. woman and 174-lb. man burn about 280 and 350 calories during seven hours of sleep and about 800 and 1,000 calories doing eight hours of office work, based on data compiled by the Harvard Heart Letter. If the woman and man burned an additional 800 and 1,000 calories in eight hours of sedentary activity, they have burned 1,880 and 2,350 calories in 23 hours. Mathematically, a woman who ate 1,900 calories needs to burn 20 calories in an hour of exercise to break even; a man who ate 2,400 calories needs to burn 50. The woman and man need to eat more than 1,900 and 2,400 calories daily if they want to exercise intensely. Bicycling 13 mph for an hour requires a 138-lb. woman to consume about 370 calories and a 174-lb. man to consume about 470 calories, according to "Swim, Bike, Run," written by Dr. Glenn Town, Ph.D., and Todd Kearney. Consequently, the woman needs to burn 390 calories to break even, and the man needs to burn 520. Most of the additional calories should come from carbohydrates. 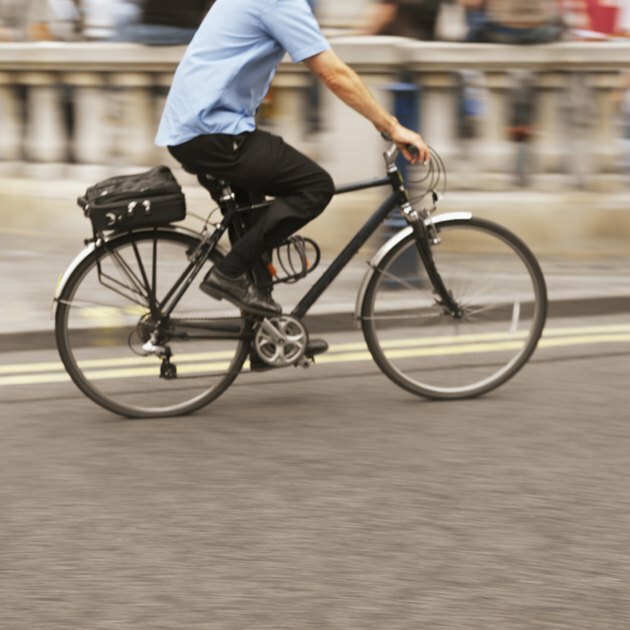 Bicycling 13 mph for an hour burns about 540 calories if you're 138 lbs. and about 660 calories if you're 174 lbs. The woman lost 150 calories during the day; the man lost 140. They would take 23 and 25 days respectively to lose 1 lb. because 3,500 calories equals 1 lb. They would burn more calories daily if they bicycled longer or faster or did exercises that burned more calories. About 30 exercises, including running and vigorous swimming, rank higher, the Harvard Heart Letter reports. How Many Calories Should an Adult Male Have Per Day? What Are Some Exercises to Lose Two Pounds a Day?